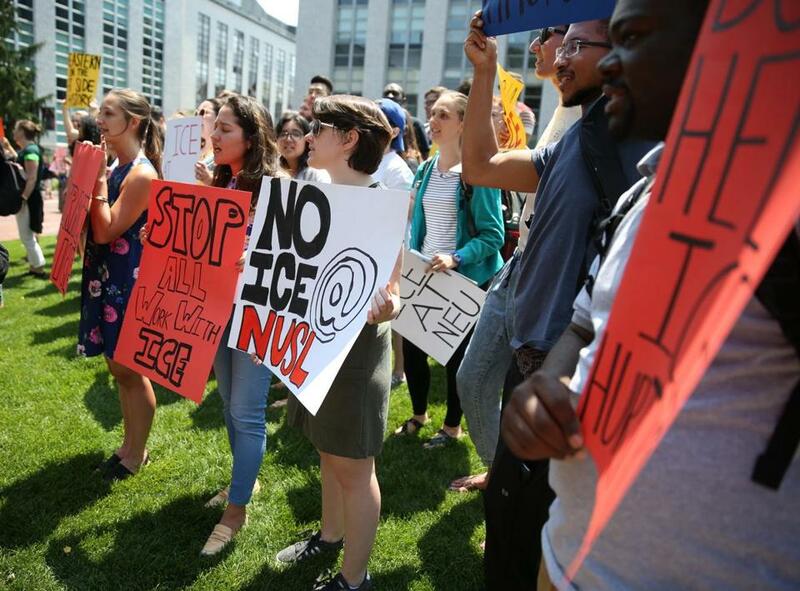 Students at Northeastern University protest the Immigration and Customs Enforcement agency in July. Julio Ramirez was behind bars awaiting trial last summer. There was just one problem: He wasn’t available to face his charges in court. Ramirez, a immigrant from Guatemala, had been arrested after a minor traffic accident in August. Police had charged him with driving under the influence, and the charge led to him being held in Boston by federal immigration officials, who were threatening to deport him. Ramirez came to the United States 14 years ago fleeing persecution in Guatemala. He worked in construction, volunteered for community organizations, built a life. Ramirez hadn’t been convicted, but he couldn’t clear his name either. Officers from Immigration and Customs Enforcement — the agency that was holding him — refused to take him to court to answer for the OUI charge. After a lawsuit filed by the American Civil Liberties Union of Massachusetts, ICE relented and took him to court, where he was ultimately acquitted of the drunken driving charge. Ramirez’s case highlighted a major and overlooked issue. Many people who are held in ICE custody are awaiting trial on a charge in state court. But there is no guarantee they can keep the court date that might offer the only path out of detention. You can’t clear your name if you can’t go to court, and many of those held — no one knows how many — weren’t being allowed to go to court. Read: Did a Newton judge help a man flee ICE? It’s an unfair Catch-22. And it’s about to change. Under a deal recently struck by the state’s trial courts, the ACLU, public defenders, and the sheriffs of three counties, trial judges will now be able to order that defendants such as Ramirez be brought to court — so that they will be able to answer the charges that, in many cases, led to their incarceration to begin with. ICE has also agreed to cooperate. The deal represents an unusual act of collaboration among many players in the criminal justice system. Delivering detainees to court is just one part of a larger issue. ICE’s enforcement policies have become a huge issue throughout the court system. Many people in the system — such as Suffolk District Attorney Rachael Rollins — worry that immigrants are fearful to go to court for totally valid reasons, such as pursuing restraining orders. One district court judge, Shelley M. Joseph, has even come to the attention of a federal grand jury that is probing whether she helped a detainee avoid ICE detention. As far as I’m concerned, the investigation of Joseph is a travesty. Leave the judges alone. Guaranteeing the right of incarcerated people to go to court is a victory for justice. But it’s only a first step in addressing overzealous immigration enforcement. What’s needed next is to kick ICE out of Massachusetts courthouses altogether. The price of its presence — a chilling effect on a whole class of people terrified to go to court in any capacity — is counterproductive and deeply un-American. We should want people to feel they can go to court and seek relief. We should want people who have minor outstanding warrants to testify against people accused of far more serous crimes. Our national paralysis on immigration reform shows no sign of abating, but state courthouses are a terrible place for the consequences of that failure to play out. Some people at ICE probably thought they were doing their job when they refused to allow Julio Ramirez to court to stand trial for operating under the influence. But he was innocent. And now — at least for the time being — he’s free. Once again, he’s a man with no criminal record. How many more people could clear their names — if they could have their day in court?